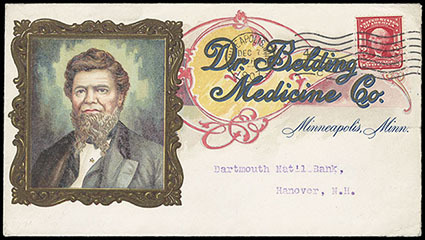 1903, 2¢ carmine, tied by "Minneapolis, Minn, Dec 7, 1907" machine cancel on all-over multicolor "Dr. Belding Medicine Co." portrait advertising cover to Hanover N.H., Extremely Fine and striking, a wonderful medicine related advertising cover. Scott No. 301 Estimate $250 - 350. 1903, 5¢ blue, tied by "Alameda, Cal. 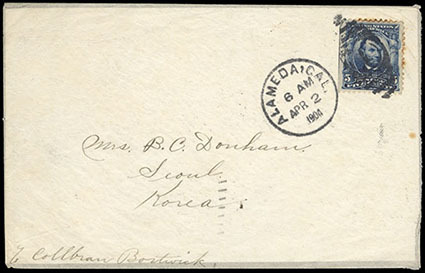 Apr 2, 1904" duplex on tissue paper cover to Seoul, Korea, reverse with San Francisco (4.2) and "Seoul, Coree, 22 Avril 04" arrival cds, some perf toning, otherwise Very Fine and rare destination. Scott No. 304 Estimate $200 - 300. 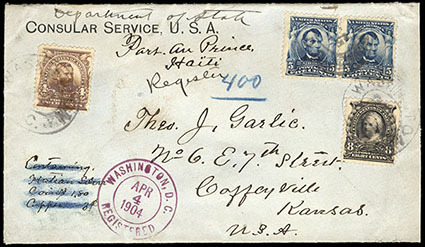 1902, 8¢ violet black, used with 4¢ brown (303) and 5¢ blue (304) pair, all tied by "Washington D.C., Reg" oval cancels, purple "Washington, D.C., Registered, Apr 4, 1904" double-circle cds on blue Consular Service envelope endorsed "Department of State, Port au Prince, Haiti" to Coffeyville Kans., endorsed "Containing Hatian Silver Coins 1.80 Copper 3¢" at bottom left crossed through in blue crayon, Very Fine and rare registered incoming Consular cover from Haiti, ex-Landau. Scott No. 306 Estimate $200 - 300. 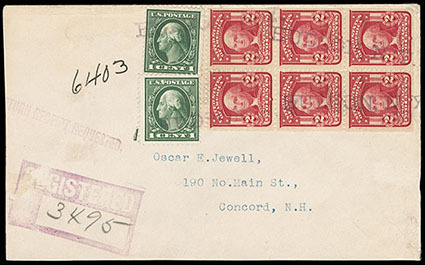 1903, 2¢ carmine, type I, booklet pane of 6, in combination with 1¢ green, two singles on 1914 registered cover to Concord, N.H., tied by purple Hudson, N.Y. cancels, appropriate backstamps, Very Fine, a rare complete booklet pane usage. Scott No. 319g Estimate $500 - 750. 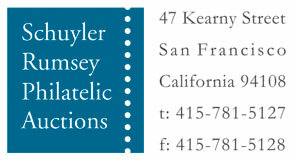 1910, 1¢ green, vertical coil, two strips of four and two pairs, each tied by multiple strikes of "San Francisco, Cal." 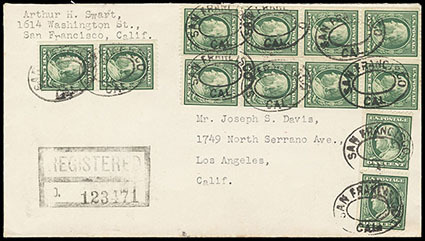 double-ovals on registered cover to Los Angeles Cal., reverse with San Francisco Sta. No. 23 (3.23) cds's and Los Angeles Sta. P (3.24) arrival cds, Very Fine and scarce coil franking. Scott No. 385 Estimate $200 - 300. 1938, 18¢ Presidential, tied to 1942 legal size envelope paying the 15¢ registry fee and 3¢ return receipt fee on a free-franked Military usage from Cincinnati, O. to Louisville, Ky.; all proper backstamps, Very Fine, a rare single usage rate. Scott No. 823 Estimate $200 - 300.